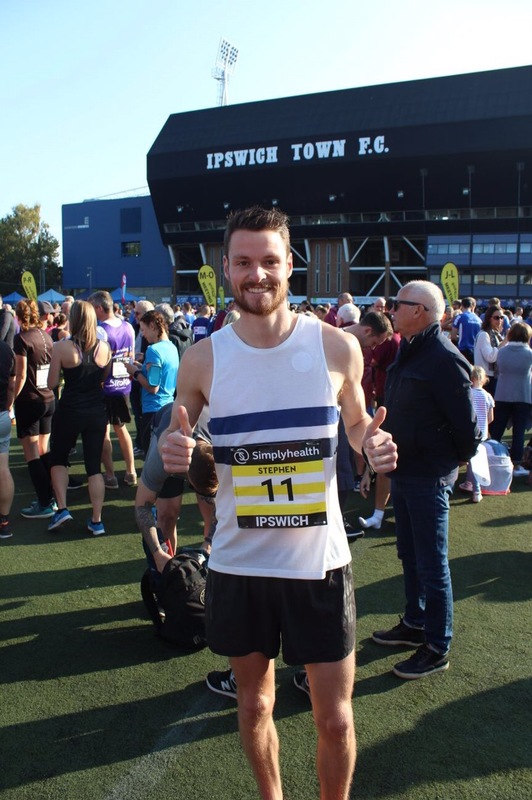 On Sunday the 24th of September, I took part in the Great East Run (Ipswich Half Marathon). I decided to do this race because Lorna and the rest of Team Elliot (Alex, Rob, Phil & Rachel) wanted to do it and renew their sibling rivalries. Fortunately, I was contacted a few months ago by Duracell, one of the headline sponsors, and they offered me free entry. Winning! As Ipswich is relatively local to Lorna’s family we stayed with them in Colchester for the weekend. We arrived just in time for dinner, Rob had cooked chicken and sweet potato fries and Sheilagh (Lorna’s Mum) had made her amazing sticky toffee pudding. Similarly, to before Colchester Half earlier this year on Saturday morning I ran 5k with Rob to shake the legs out. We had both tapered well during the week but wanted to keep the legs ticking over ahead of the big day. In the afternoon, I played golf with Alex, and Lorna’s Dad Bob. As I don’t play golf regularly anymore it was great to get out on the course, it was a closely fought contest but I just managed to win as Alex found the pond near the 18th green (sorry Al I had to mention it). Lorna, Alex, Rob, Ray and I headed to Nando’s (#NandosAthletes) to fuel up on Saturday night before getting an early night. 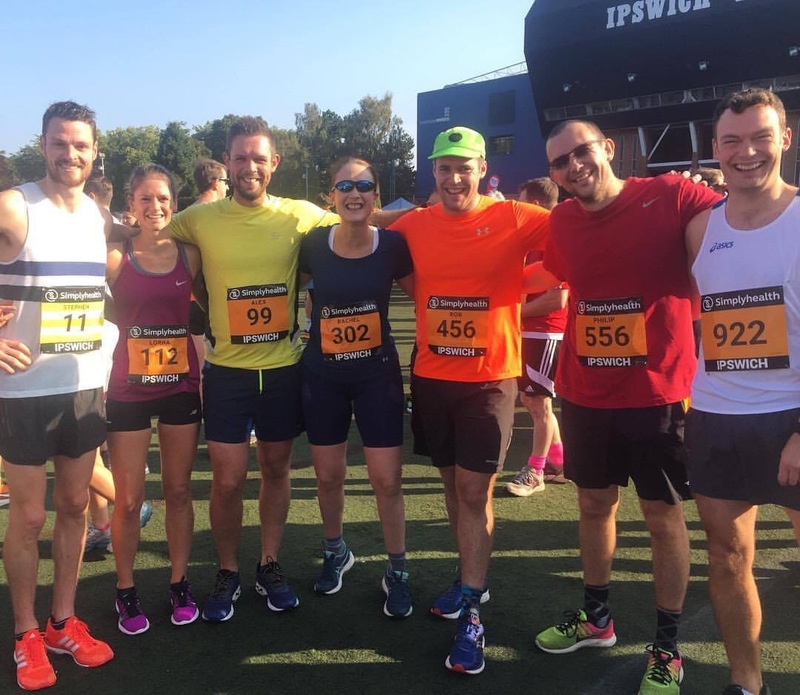 The race started and finished just outside Portman Road, Ipswich Town FC’s Stadium. The race village was positioned on the AstroTurf just outside the stadium and conveniently there were lots of large car parks nearby. As with most large running races our numbers were sent to us in the post. I am glad that races now share their race programmes online and that they keep what they send out to a minimum. Attached to the race number was a bag drop label and a few promotional offers. After fuelling up on bagels for breakfast we arrived at the Race Village around 9am, roughly an hour before kick-off, so we only had to spend a short period of time in the queues for toilets. There seemed to be plenty of toilets available between the car parks and start area and on the AstroTurf near the baggage tent. The bag drop was efficient as the tent was large and each coloured start (orange, green, white) had a designated section. There were lots of volunteers on hand and they all seemed eager to help which is the most important thing. Having not visited Ipswich before I didn’t know what to expect of the route. 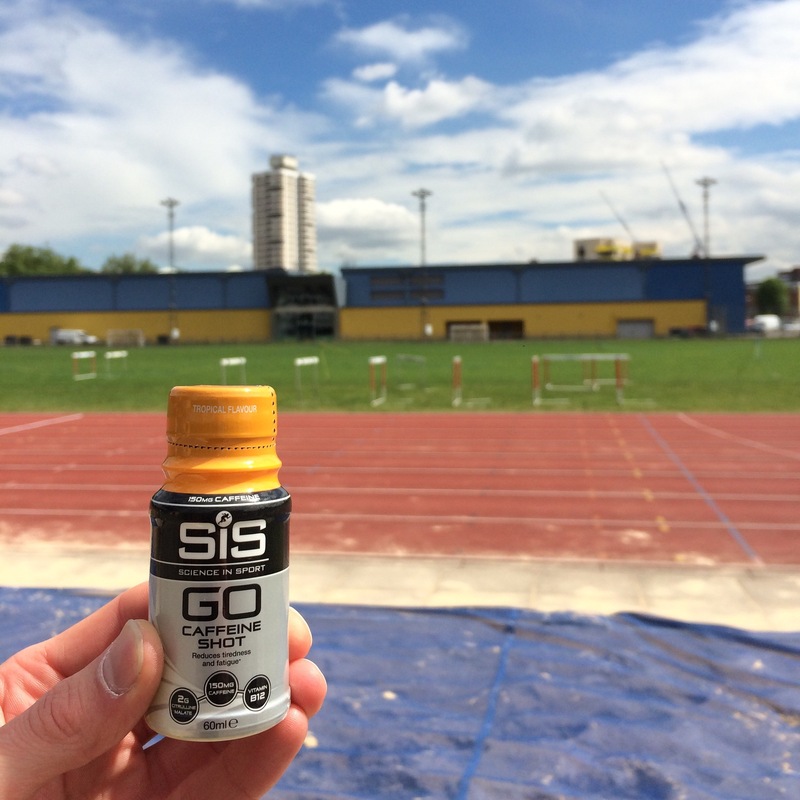 It is becoming increasingly popular that running events start and finish at football stadiums; Colchester Half, Reading Half, Manchester Marathon to name a few. I guess it makes sense as the infrastructure is in place to cater for thousands of participants and supporters. The race started on Russell Road, it was relatively wide and there was room to do a few strides along the pavement before making my way onto the start line. As the weather was nice the crowds were out in force and the adrenaline was pumping. The first few miles are nice and flat so you can get into a good rhythm and figure out who you’re going to be racing. Around the 5k point near Holywell Park there are some short sharp inclines to contend with but you are soon back on the flat alongside Ipswich Wet Dock. This was one of my favourite parts of the course as supporters cheered energetically from the pavements. The runner in first position was off into the distance but as I was in the chase group we had a cyclist escorting us, geeing the crowd up. Once we had made it onto the South side of the River Orwell gaps were opening and I knew I would be in a group of three for a while. The other two runners seemed to be holding the pace relatively comfortably, I felt good and decided as there was a long way to go I would tuck in behind to try and shelter from the headwind which was quite strong. Photo courtesy of Andy Abbott. 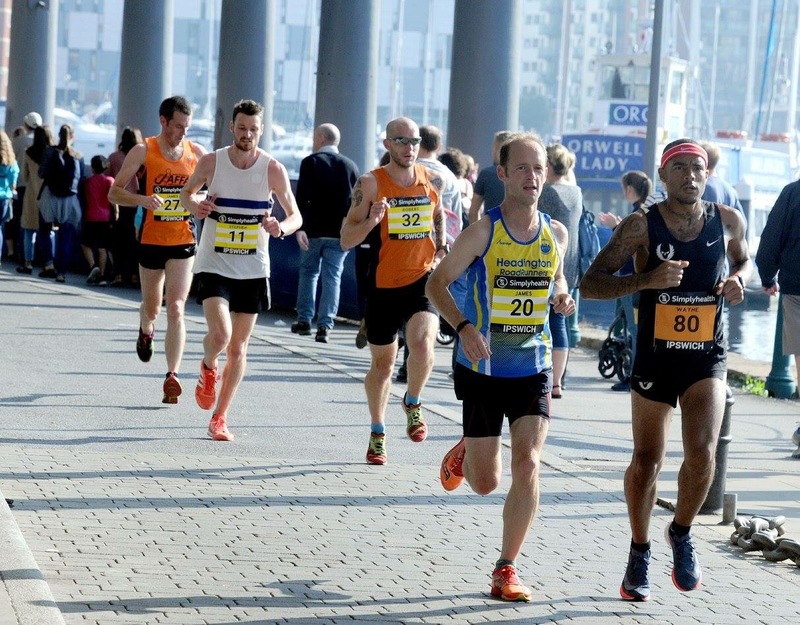 At around the 10km point, passing under the Orwell Bridge, I knew a PB or sub 75 was out of the question but I wanted to give it everything and see if I could finish on the podium. Running into the wind and up a long hill that lasted roughly a mile from 12k my pace dropped considerably. However, I knew that the wind would be at our backs once through Freston and heading towards Ipswich city centre. After 14km one of the runners pushed on and was looking strong, I guess he was aiming for sub 75 and a championship entry time in London next year. I too had picked up the pace a little and so pulled away from 4th place. From 15k I was in no man’s land. Luckily as I was making my way along The Strand and then the A137 I got so many cheers and words of support from runners heading in the opposite direction. It was cool that I got to see Lorna and her brothers and sister and shout at each other, encouragement not abuse ha. I was starting to hurt with 5k to the finish line. I had no-one to chase, I knew I wasn’t far in front of 4th, my legs were heavy from completing OCC three weeks prior, it was a long straight road but I had to hold it together. Whenever I am in a race and struggling I just keep thinking “I haven’t run this far at that pace to ease up or stop now” or “throughout this race I’ve had a few ups and downs, I’ll feel good again soon”. 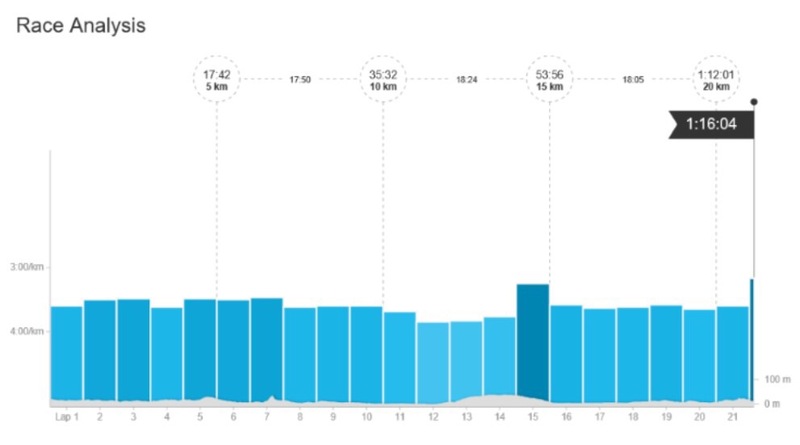 I held my pace between 3:30min/km and 3:40min/km and refused to turn my head to see how much of a gap I had on 4th. After crossing the river, there was 2km to go. 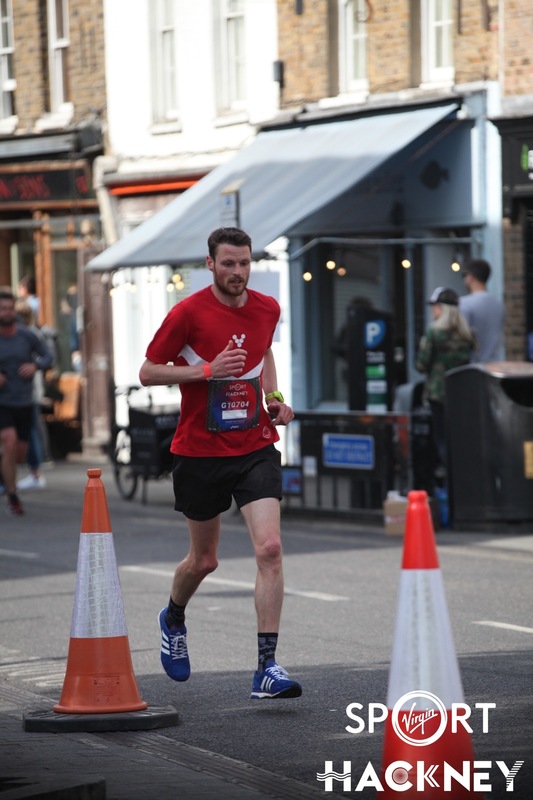 As I neared the finish line the crowds were growing, the man on the bike accompanying me pointed at the KFC to the right of us and said, “there’s no time for KFC now, you’re almost there”. I turned the corners around Portman Road, I couldn’t hear footsteps or a runner breathing heavily behind me. 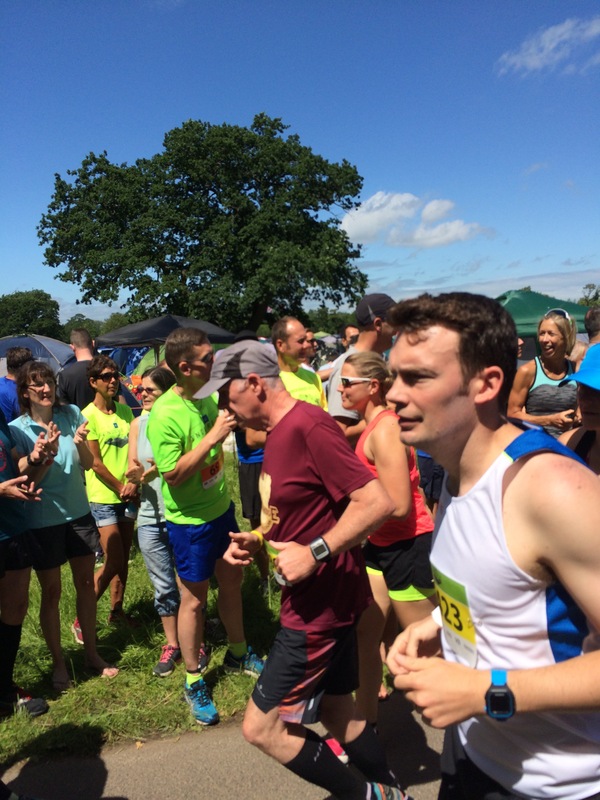 I upped my pace, I didn’t have a sprint finish in me but I had made it to the line in 3rd position, 1:16:07. The volunteers at the baggage tent cheered my arrival, I caught up with Lorna’s Dad and did a quick interview (Hi mum!) before cheering Team Elliott and Robbie Smith through the finish. Left to right: Me, Lorna, Alex, Rachel, Rob, Phil & Robbie Smith. 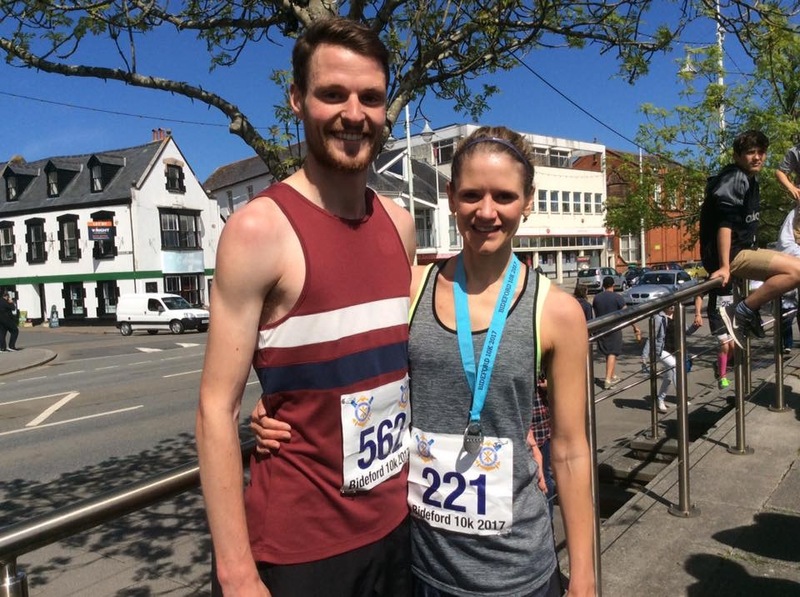 Everyone ran well and achieved great times; Alex finished in 1:31:27 in 99th position, Lorna crossed the line in 1:32:55, 7th lady and 4th in her age category, Rachel ran a 20 second PB in 1:42:24, Rob did 1:42:51 which is even more impressive given he suffered cramp at 20k, and Phil clocked 1:47:40 despite not training much since his wedding and honeymoon. Overall, I really enjoyed the course and it was a great race. 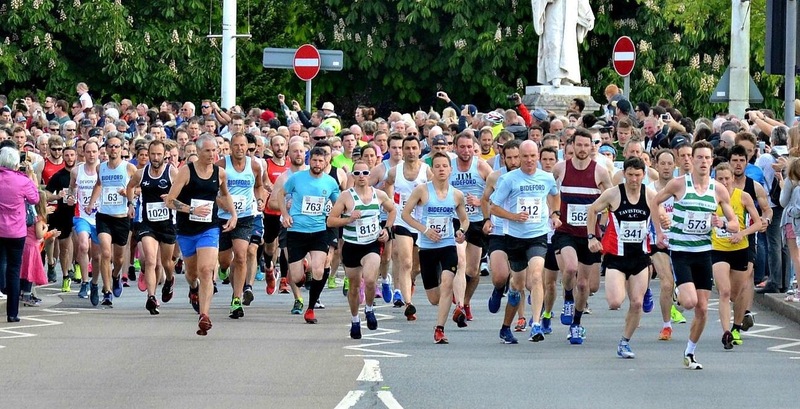 For some reason, I envisaged the route would be pancake flat and so was surprised by the hills but I would still recommend the event for someone looking to do a well-supported, scenic, fast race. 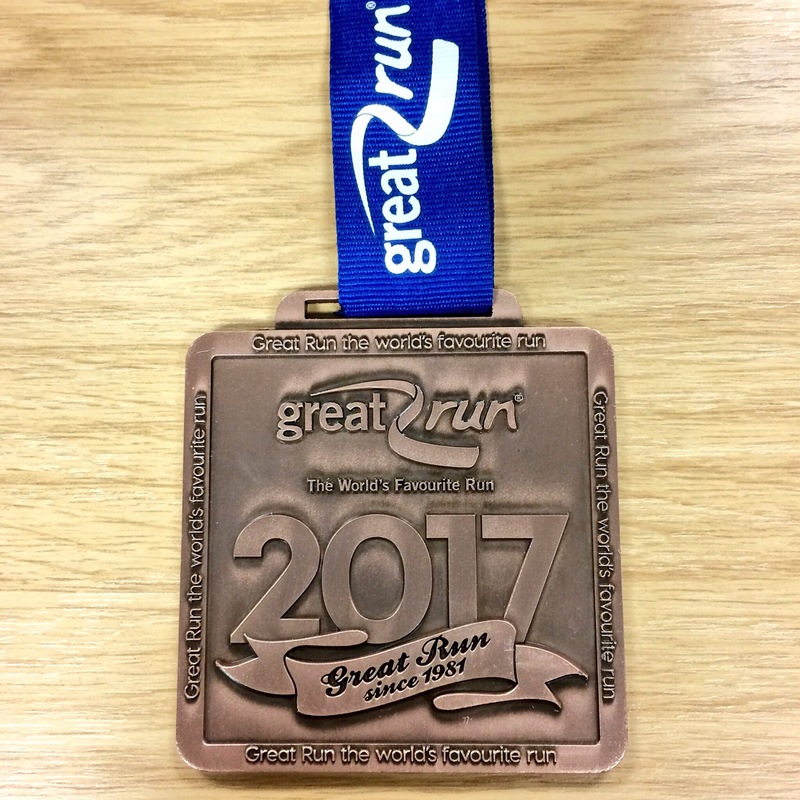 The Great East Run (Ipswich Half) medal is nice; good size, weighty, smart design. Bling geek! The goodie bag was substantial. It included; a protein bar, oat breakfast drink, water, promotional leaflets etc. If it fits in the race calendar next year I will definitely return to try and beat my time and position. It was a lot of fun this year! Next up for me is the Lisbon Marathon in a couple of weeks. I’m hoping to get one decent long run in and then it’s taper time again. 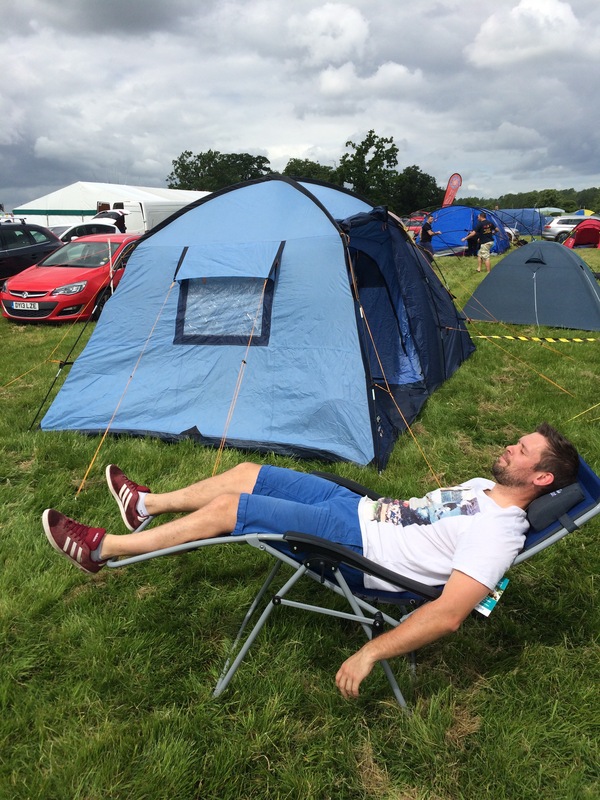 Over the weekend of the 10th & 11th of June I took part in Endure 24 for the second year running (pun intended). In stark contrast to getting a late place in 2016, Lorna, some friends and I signed up as soon as possible because we knew it would be a fun weekend and a great way to get lots of miles in. Initially we were in a team of 7: Me, Lorna, Alex, Robbie, Frosty, Michalis and Jess. 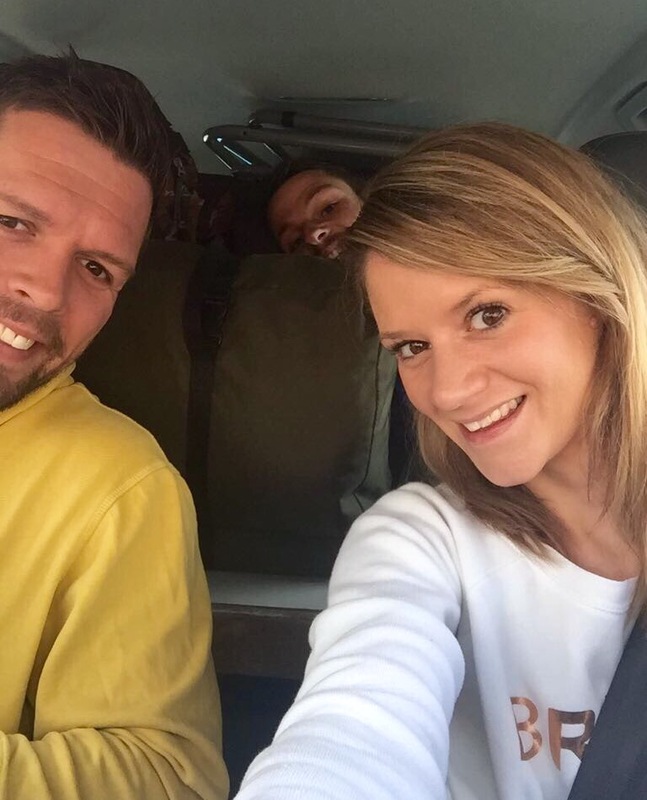 Unfortunately in the couple of weeks leading up to the event Michalis and Jess could no longer take part but Jess decided to make the trip to cheer us on and look after us. With the team being reduced to 5 we all knew we’d be banking some big mileage, this was good for me as I have OCC at the end of August. This was not so good for the likes of Robbie who is predominantly a track runner. Learning from 2016, Lorna and I packed up all our kit on the Thursday night to meet Alex for a lift to Wasing Park early on Friday morning. 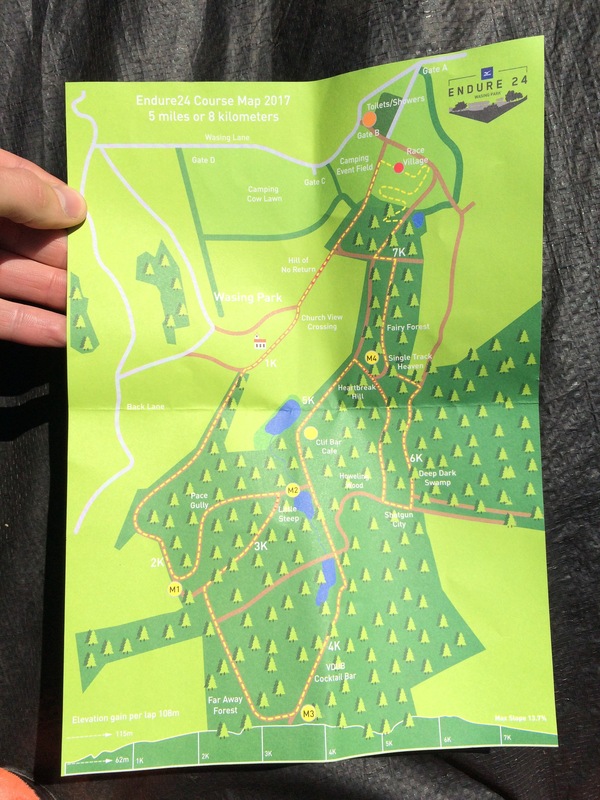 As Endure is “Glastonbury for runners” it’s a good idea to get there on the Friday to get a convenient area to set up camp. 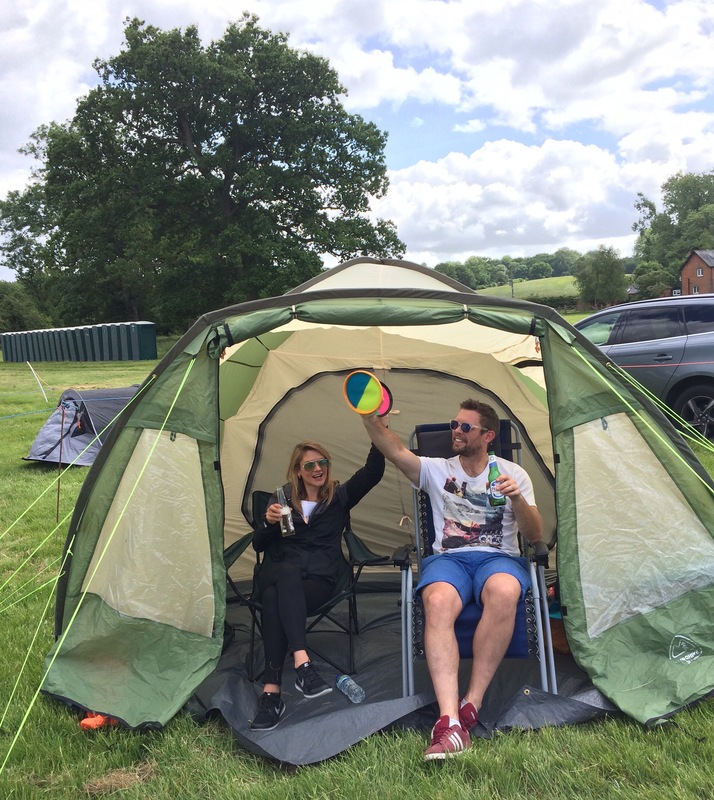 We opted for the same location as last year as it was right next to the handover point, food and retail tents, the registration marquee and showers/toilets. Alex chilling in the comfiest chair in the world! 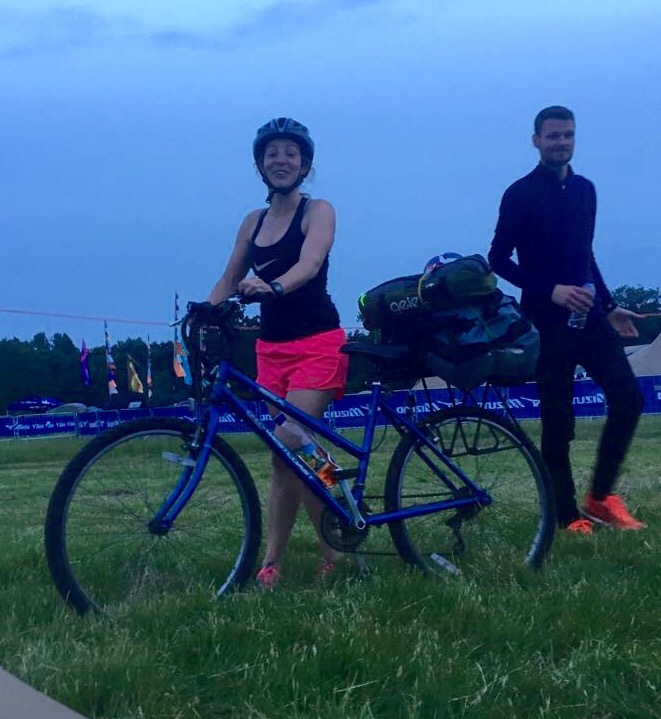 Once we were let into the race village we pitched up all of our tents and then drove to the nearest Sainsbury’s to do a BIG food shop. 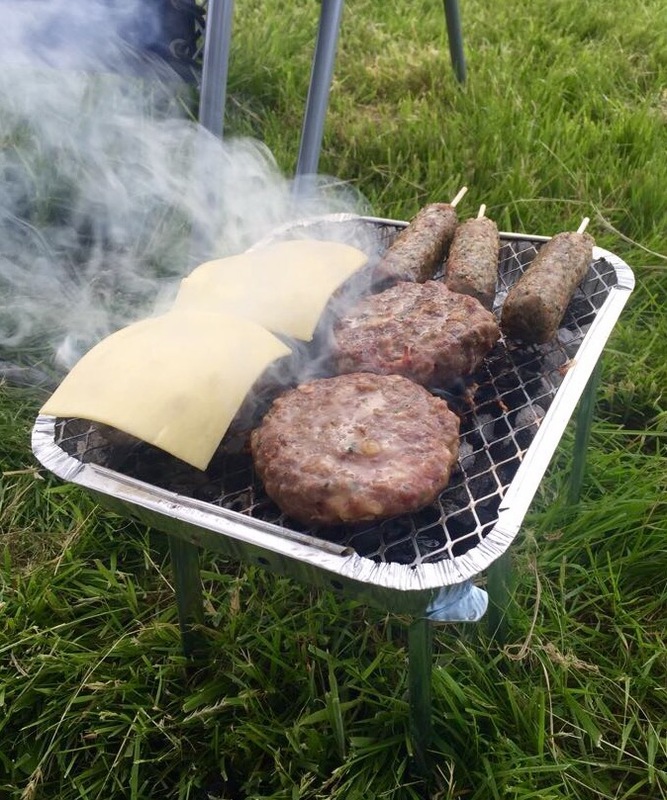 Barbeques, snacks, ice, football (all the essentials) were on the shopping list. There wasn’t a list, but we probably should have made one to stick to. We spent quite a lot but in the grand scheme of things it wasn’t much split between the group and it definitely worked out cheaper than buying all of our meals on site. When we got back to camp we had lunch before picking up race numbers and timing chips from the registration tent. 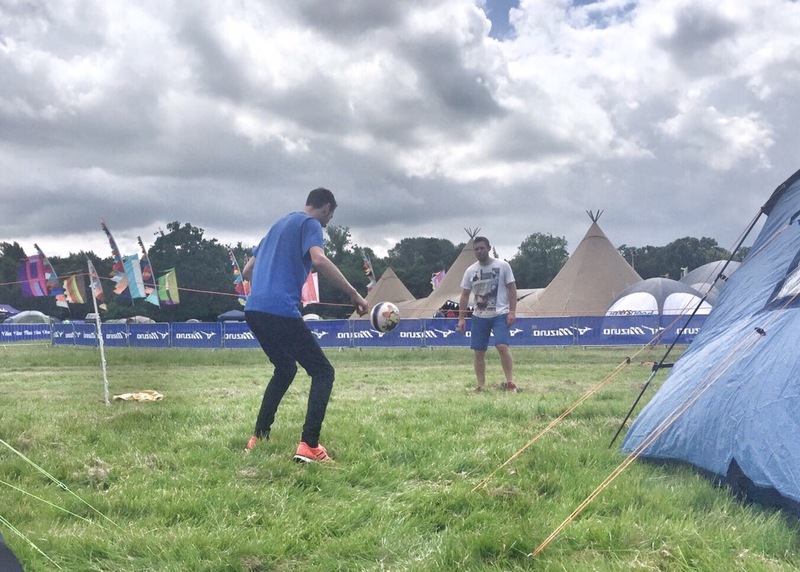 We spent the afternoon chilling, playing games and walking the course to show Alex what to expect. To be honest he didn’t really need to see the course as he would get VERY familiar with it over the next couple of days but then again it was good for us to look at the course and think about our pacing especially for the first few laps. Once back at camp again it was time to fuel up. Alex got the BBQ going; we had burgers, chicken, sausages and halloumi skewers, all the good stuff. We had a couple of drinks whilst waiting for Jess to arrive; she was cycling from London (bonkers)! With a big 24 hours ahead of us we all got an early night foregoing the party in the marquee. I slept quite well on the Friday night; I was pretty tired because of the early start and having run decent mileage in the week. Robbie and Frosty were due to arrive at 10:30am so we got some sausages and bacon going on the BBQ. I tend not to eat much before races but with events like this you definitely need to fuel up. Also I knew my first lap wouldn’t be until 12:40ish with the team order sorted: Robbie, Me, Frosty, Lorna, Alex. Dropping down to a team of 5 meant we would get around two and a half hours of rest between laps. The start of 24 hour events is a little bizarre, everyone is excited but you can tell they are trying to keep calm and remember there’s a long way to go. Well, apart from the one person that always sprints off the start line like a bat out of hell. Luckily for our team Robbie started a bit further back than he probably would’ve liked and got boxed in. The start is also strange because it’s the only time (apart from the finish) that everyone is together, the race village generally seems quite subdued and quiet the rest of the time and you almost forget how many runners are taking part. As Robbie was handing over to me I headed back to the tent to sort my kit, I was really looking forward to getting out there. Robbie came into the handover area clocking 34 minutes for the lap. With OCC in mind and knowing I would probably be looking at doing 7 or 8 laps over the 24 hours I went out at a steady pace. The route was just as I remembered it (I did walk it only the day before). The “Hill of No Return” felt relatively easy having completed a couple of hill sessions over the last few weeks but I knew it would just get steeper and steeper as the hours passed by. The few kilometres after the hill are nice, the course is undulating but you can get into a good stride. “Little steep” just before 3k is short and sharp, it was muddy but in my Inov-8 X-Talon 212 I moved through this section well and was back onto a good pace quickly. From 3k to 5k there are long straights which include some small rolling hills; this section is one of my favourites on the course. You go through “Far Away Forest” and pass the “VDUB Cocktail Bar” around halfway (4k). Approaching the 5k point you know you are coming up to the hardest part “Heartbreak Hill”. Luckily the Clif Bar Café is positioned just before so you have the chance to grab a drink etc. For the first few laps I “enjoyed” the climb, I was happy to shorten my stride and shuffle my way up it. The best thing about Heartbreak Hill is once you’re over it you feel quite strong and the following few kilometres are fun as they include some slight downhills and twists and turns through the trees. On the homestretch I high fived Alex (and a few randoms) before crossing the line after 34 minutes and 47 seconds of running, first lap – done. I handed over to Frosty before catching up with Lorna and chatting to some of the AR (Advent Running), Adidas Running & Pro-Direct Running lot. I made sure to grab some food quickly after finishing my lap; I decided this was best because of only having two and a half hours before going out again. Frosty clocked a time of 35:09 before Lorna ran 36:32 and Alex 36:22 (not a competitive brother at all). Robbie put in another solid lap in 34:17 and then I was up and running again. As the first lap had loosened my legs up I decided to go with the flow and put in a slightly quicker lap. On every lap I tried to make the effort to say well done to the Solo runners, it must be such a long 24 hours for them and I thought a shout may pick them up a little. I was on the lookout for my friend Matt Fowler; he was one of the crazy “Solos”. I completed my second lap in 33:44, a minute quicker than my first lap and inside Robbie’s fastest time, not that I was trying to beat it ;). The team was doing really well, after a couple of laps we were in 3rd place in our category and 21st out of all the teams. The trick to doing well in 24 hour events is having a team that is consistent and for everyone to run times close to each other. It is also key to take it steady over the first few laps and to be able to hold a good pace through the night on the laps using a head torch. I was the first runner in our team to do a double; it was around 10pm so it was still light for most of the first lap. I was kindly given a Silva Trailrunner 2X to test; it was really comfortable, lightweight and most importantly really bright. 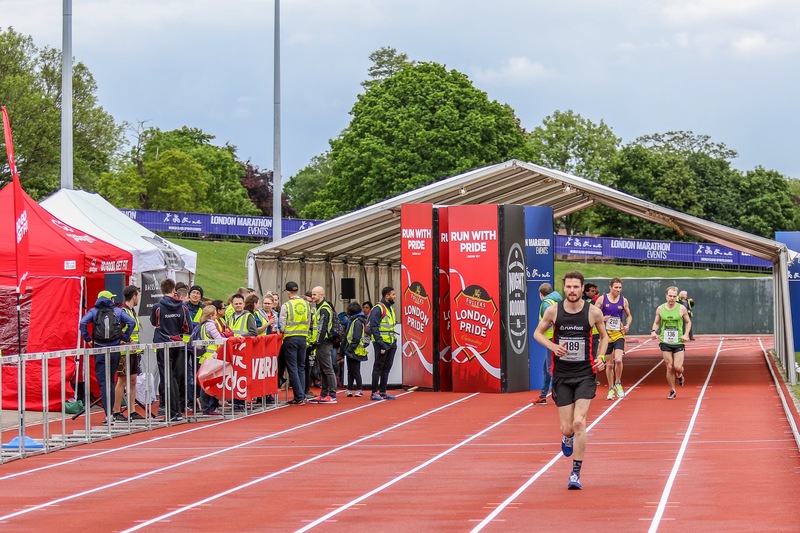 As I had taken the first few laps steady I could still hold a decent pace, I was planning to finish the double lap in 1:20 but found myself crossing the line nearer to 1:15. I think I could hold a quicker pace because it was nice and cool and the adrenaline was pumping. I was happy to put in more effort over the double lap because I planned to eat lots and get some sleep ready for my next lap in the morning. Everyone ran well over the double lap, on average we were only a couple of minutes slower than a normal lap. I got quite lucky in that I didn’t have to run through the rain, I felt sorry for Lorna and Alex. After completing his double lap Robbie messaged the team to let us know that he was struggling, his left groin had gone and “that was 1hr42min of absolute agony, hurts on the uphill, hurts on the flat and hurts most of all going downhill on uneven ground so pretty much everywhere on the course”. Being a track runner Robbie did well to bank as many laps as he did (6). We were down to four which meant we’d have to take it steady on the rest of the laps. 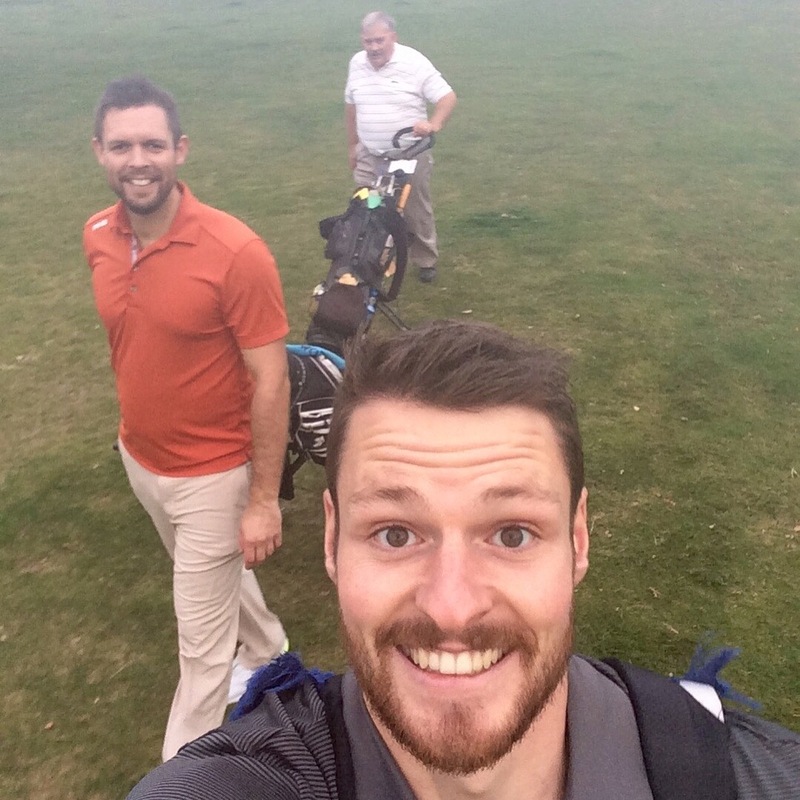 Everyone was knackered, we were all thinking about sleeping more and not worrying about having someone out on the course. My first lap in the morning was a struggle as my legs had seized up after having a couple of hours sleep. A few kilometres in they loosened up a little but I took it steady to make sure I could get round and I knew I’d still have one or two more laps to complete. I bumped into Matt around 6k; he was only 10 miles or so away from clocking 100 miles. As we weren’t racing I decided to keep him company for the rest of the lap, he was moving really well and seemed in good spirits. We chatted about his 24 hour strategy, nutrition and future race plans etc. Once through the “finish” line again I handed over to Frosty and Matt went off to grab a coffee. I headed back to the tents to let Lorna know she was up next. Her legs had seized up as well and she wanted a little longer before heading out on another lap, as my legs felt ok and I wanted to get the miles in I took the yellow wristband off Frosty and was on my way again. The morning laps were really tough but we were ticking the hours off. Frosty, Lorna and Alex did well to complete 7 laps each; we were still in third position in our category. At 11:22 I was heading off on the final lap, I was relieved knowing we’d got through the weekend but also sad that it was almost over. Surprisingly my legs were feeling ok; I decided to pace the lap so I could cross the line with the team just after 12 o’clock. We didn’t want or need to get another 8k in. 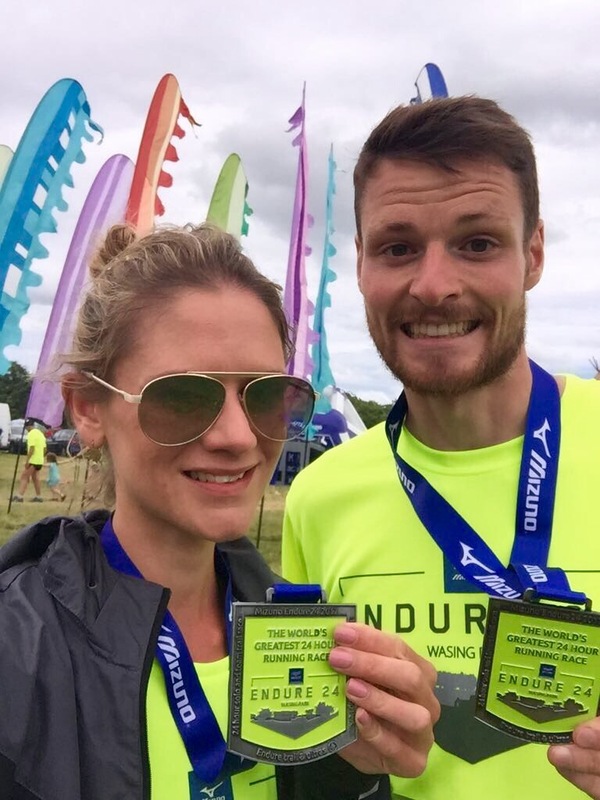 Over the final few kilometres I found myself running at the same pace as another runner, we chatted about our training, upcoming races and how we’d found the weekend. I enjoyed the twisty turny section for the last time and was then joined by the team for the final few hundred metres. We crossed the line to the sound of the klaxon. 24 hours, done! We had a celebratory ice cream, caught up with friends and then packed up our tents. The weekend went by in a blur; it was a lot of fun. 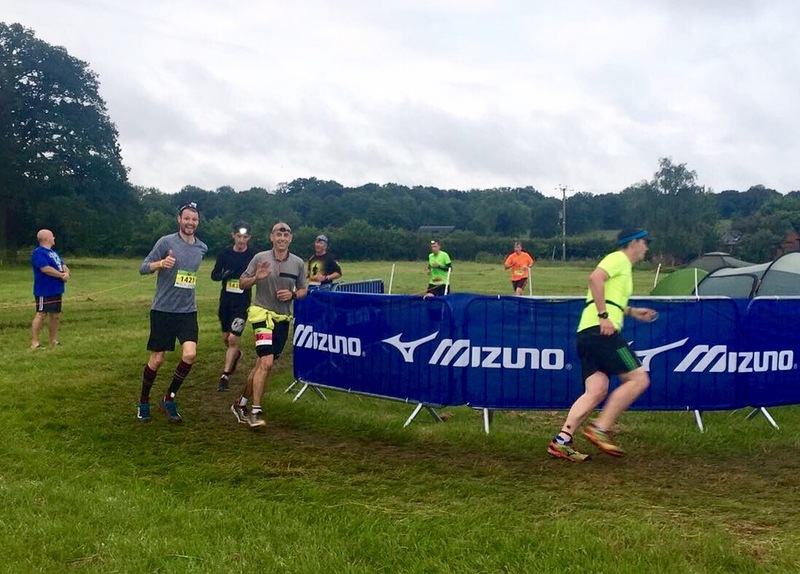 If you haven’t done a 24 hour team relay before I definitely recommend it. 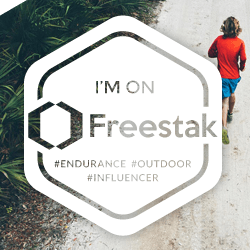 It’s such a great challenge and it’s an excellent way to get lots of miles in if you have a long distance race coming up. 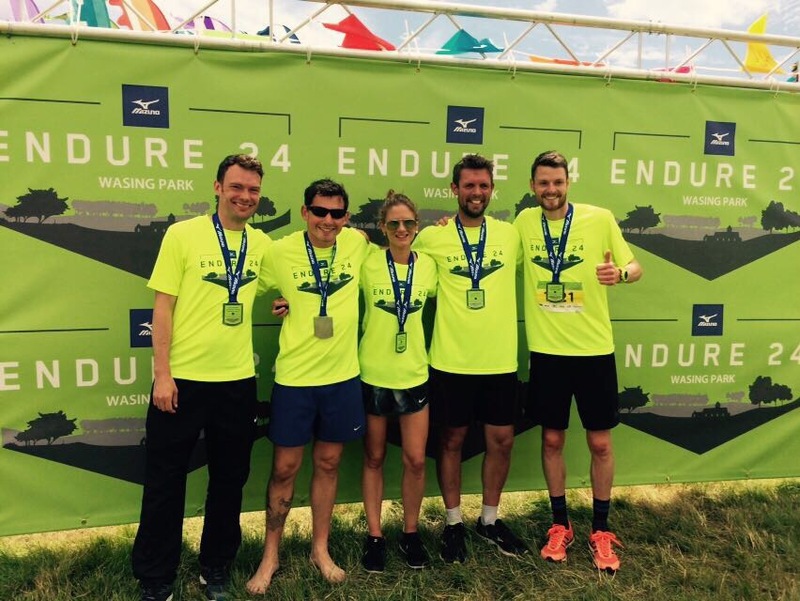 I hope those of you that took part in Endure 24 enjoyed it as much I did. 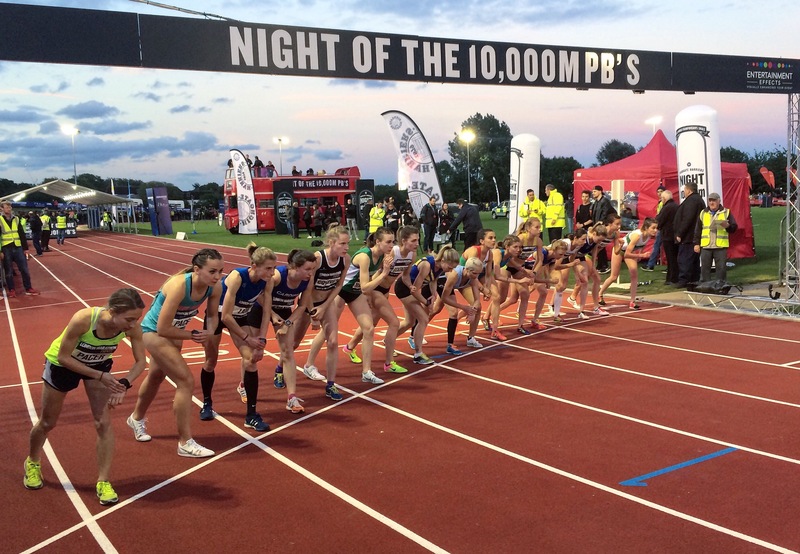 On Saturday the 20th of May I headed up to Parliament Hill Athletics track to take part in Night of the 10,000m PBs. 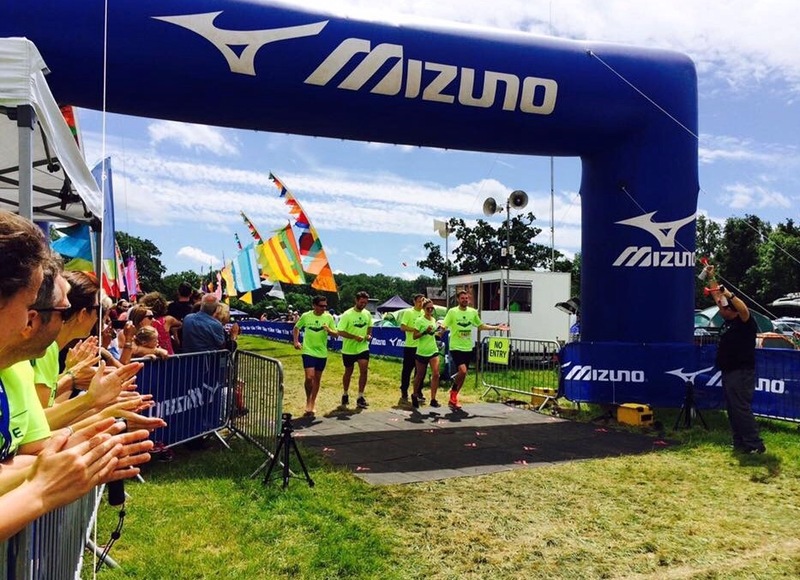 In 2015 and 2016 The Running Works retailed at the event so over the last couple of years I have seen how the event has developed and grown. The atmosphere was electric, I wanted to take part and experience the race from lane 1. 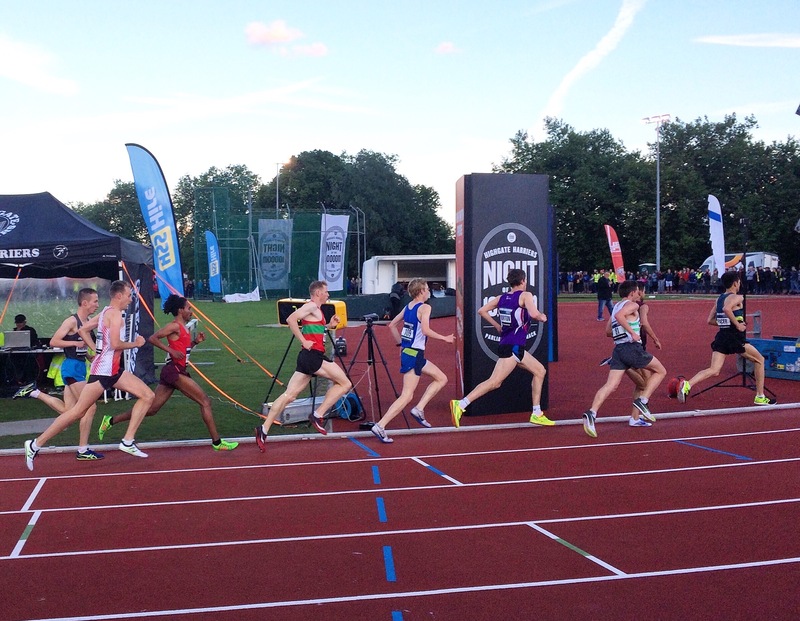 Last year I ran 34:50 in the Orion Harriers Fast Friday 10,000m at Walthamstow Track allowing me to register for the Highgate 10k. I was initially put on the waitlist as the standard had risen but in the week or so leading up to the races I found out there was space for me. On seeing the start lists I realized I was the slowest, by quite a margin, in the E race. I knew this meant I would be left behind and lapped but I was still really excited to take part, spend the rest of the day cheering on friends in other races and watch the World Championship qualifiers. I arrived at the track in plenty of time to register, pick up a race day programme from Left Spike Fanzine and sort my race kit. My race “Afternoon of the 10,000m sufferfest” had begun, luckily though I was ticking off the laps quickly (mentally) thanks to friends and supporters shouting “Go on Skinner! !” every hundred metres or so. It was frustrating not to have any speed in the legs as I was breathing so easily, if someone was running alongside (unfortunately not the case) I could’ve had a nice good chat with them. I was lapped a few times which was demoralising but at the end of the day I couldn’t be too disheartened as I had put myself in that position, the pain was self-inflicted. Every kilometre was becoming slower and slower, I had gone from 3:28min/km to 3:49min/km throughout the race, there were so many times when I thought “I could walk off the side of the track and not many people would notice” but on the other hand I was thinking I would be letting Ben Pochee and the people supporting me down. 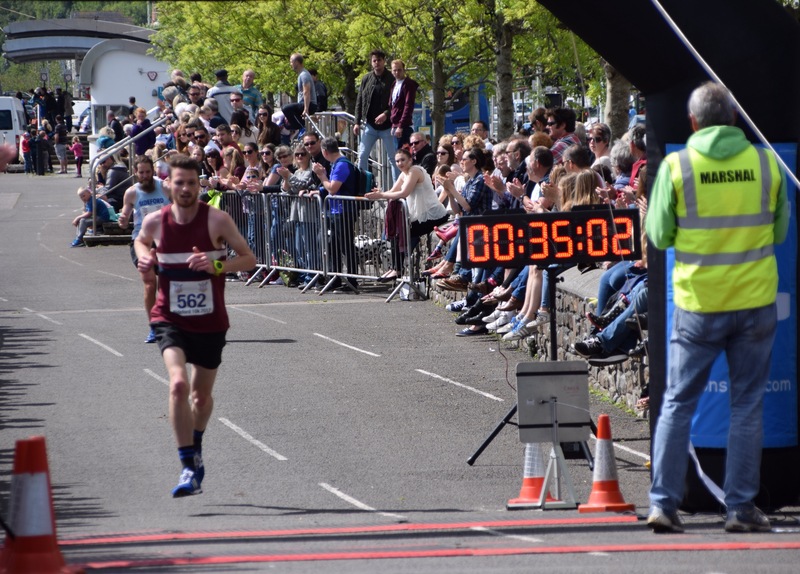 I finally crossed the line in 36:21, a minute and a half slower than my PB. It was a humbling experience and I learnt if I want to race or do a decent time I definitely need to taper. After finishing the race I walked past two guys lying on the floor exhausted. I felt guilty that maybe I hadn’t put in as much effort as them but once a PB was out of my reach self-preservation was my main priority. I did a quick cool down with Dom, he too struggled on the day but we both know why and what we need to do. I then met up with the Advent Running crew trackside; the first thing I said to them was “don’t ever do 10,000m on track”. The second thing I said was “there’s a 5,000m/10,000m event at Walthamstow Track in a couple of weeks” ha. I grabbed some pizza and we got a good position to watch the rest of the races unfold. In the men’s C race Ben Johnson (Run-Fast) had a great run beating his PB by 15 seconds or so. 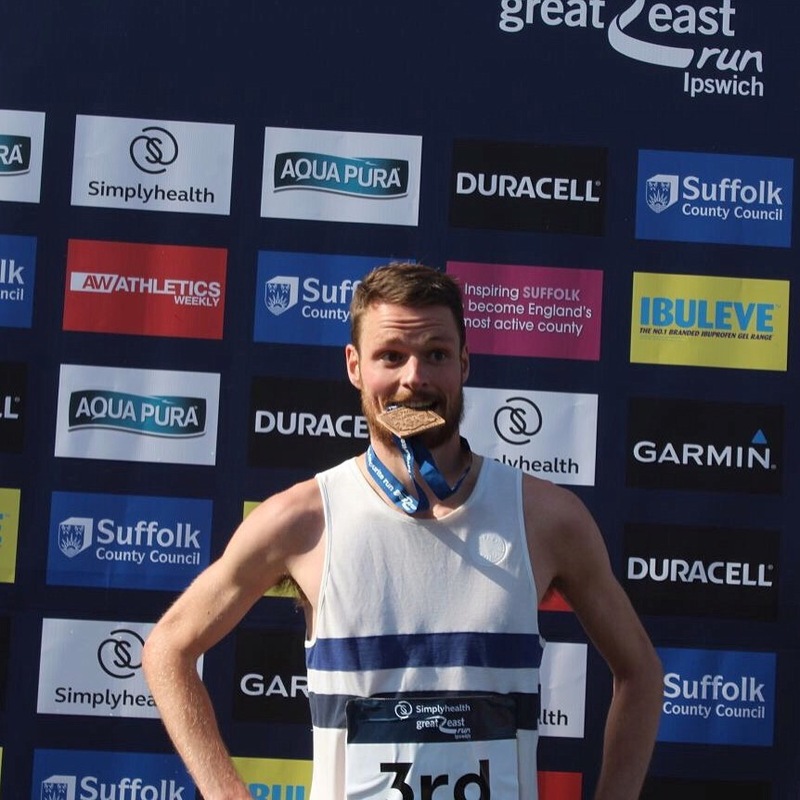 He’s in great form at the moment having finished the London Marathon in 2:21 earning an England vest in the Toronto Marathon later this year. 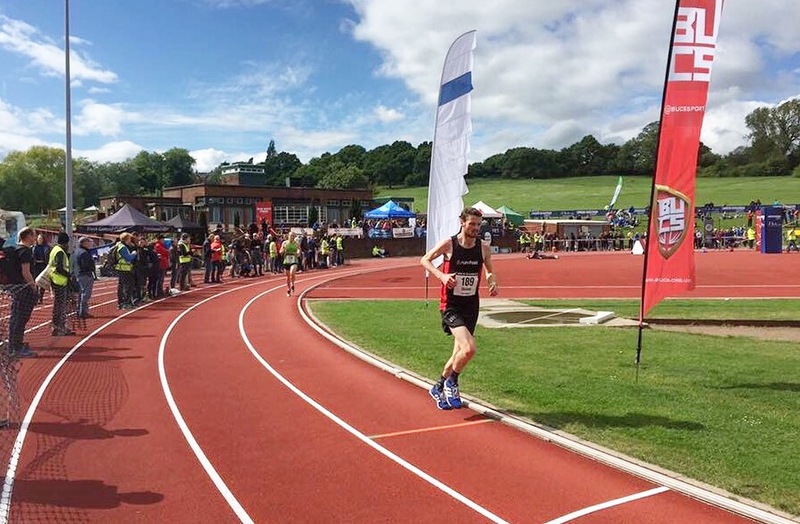 It’s great to run at track on Tuesdays with the likes of him and Pete Huck (sub 30 minute 10k runner) and see what it takes to get to that level. I felt relieved to have finished my race; I could relax and enjoy watching the rest of the races with Lorna and friends. I was looking forward to seeing who would win out of Dewie Griffiths, Andy Vernon and Ben Connor and the women’s start list was stellar. Andy Vernon opened up a large gap with 10 or so laps to go, the pace wasn’t quick enough to go sub 27:45 (World Champs qualifying time) as it was a little windy, but Andy finished first in 28:16. In the women’s race the favourites were Steph Twell, Jo Pavey, Beth Potter, Katrina Wootton and last year’s winner Jessica Martin. 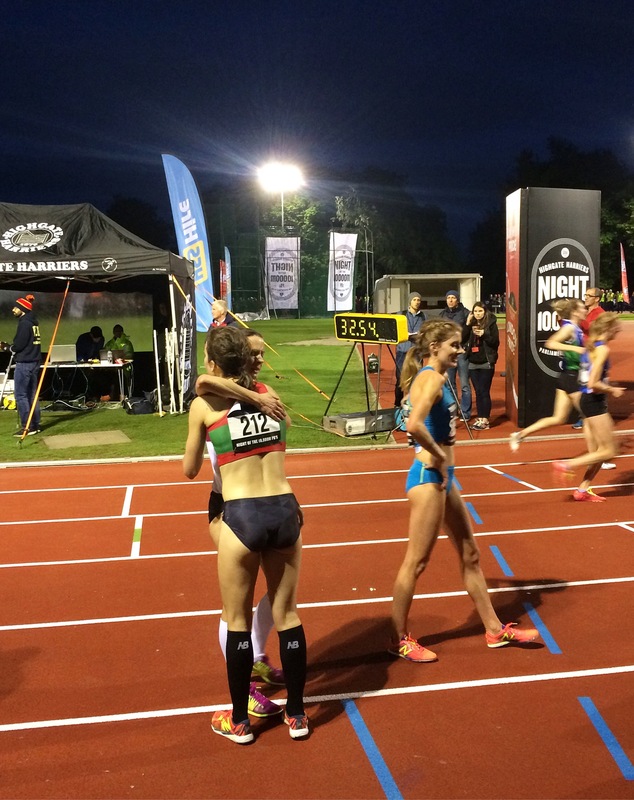 In the end Beth Potter ran away from Steph Well to win in 32:04. 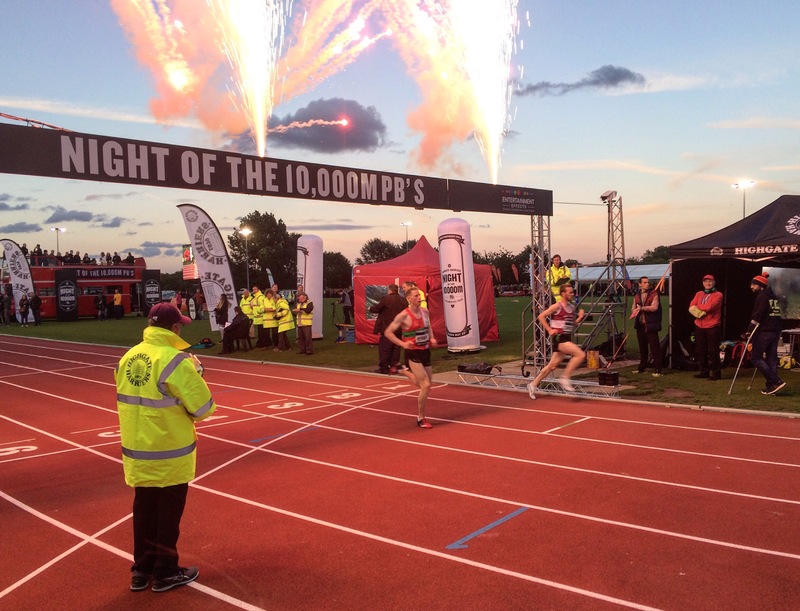 Steph finished just one second outside of the 32:15 qualifying time for the World Champs in August and Katrina Wootton took third after a good battle with Jo Pavey. The atmosphere was awesome for the A races, it makes me want to get quicker so I can one day take part in one of the later races. Overall it was an awesome day of running to take part in and observe, I can’t wait for next year already. Thanks to everyone that cheered me on in my race. I am racing in the Westminster Mile on Sunday so if you’re going to be there give me a shout. 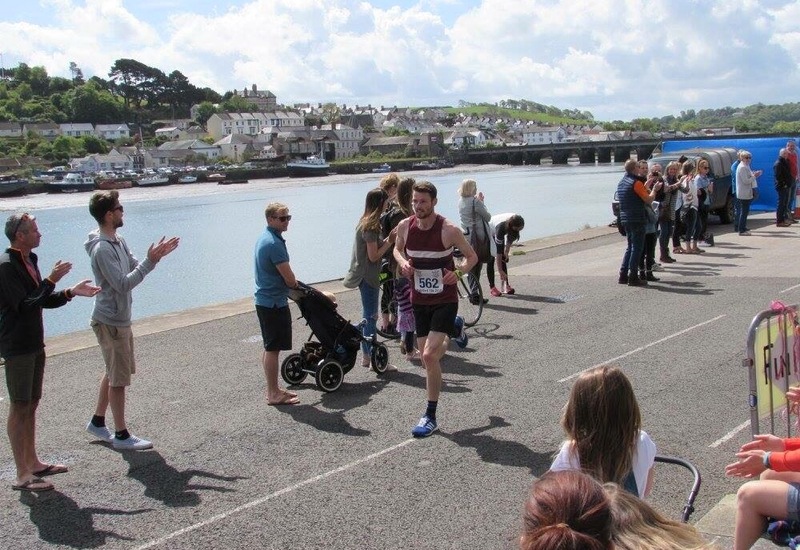 On Sunday the 14th of May I took part in the Bideford 10k. 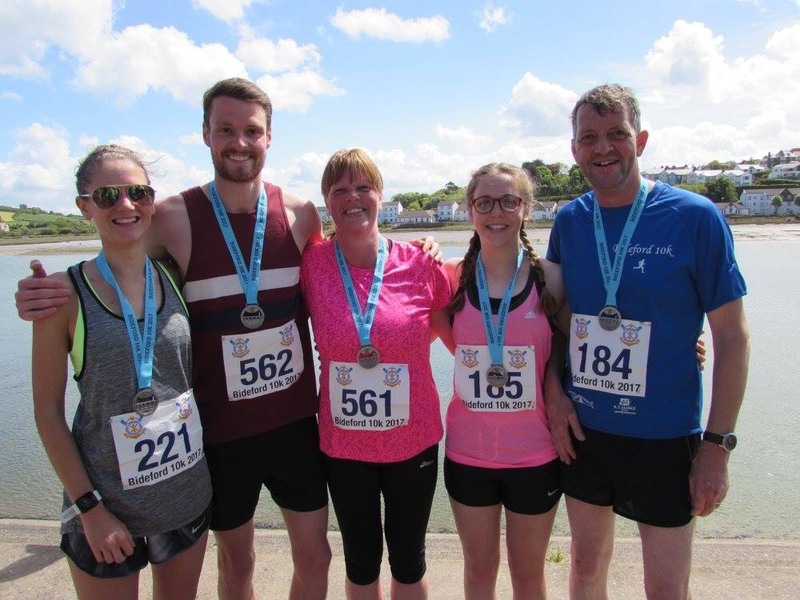 Lorna and I signed up because my mum and cousin Tilly (alongside Uncle Andrew) were taking part in their first 10k races. I never imagined that my mum would take up running but a few months back she started training. 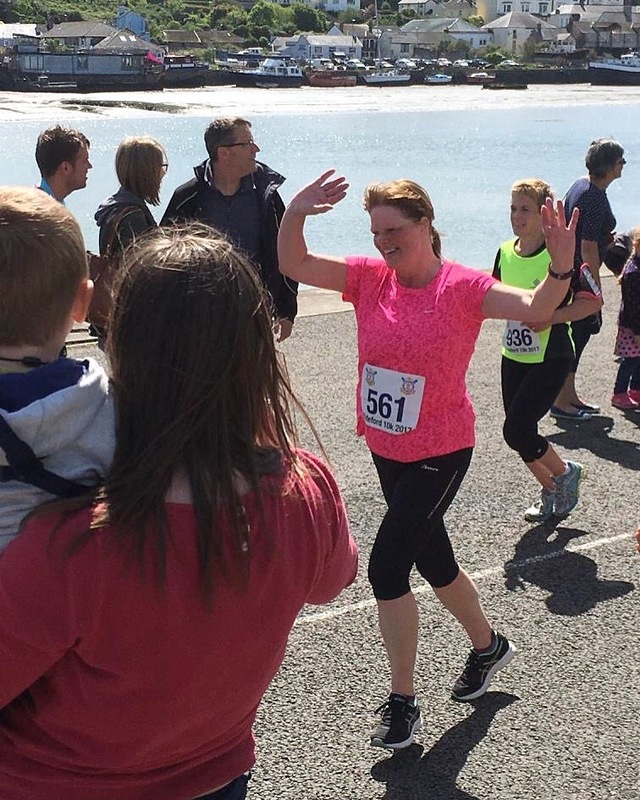 She ran the Tamar Lakes parkrun before increasing her mileage gradually. I loved getting texts like “Am really enjoying running in this fab weather. Did 5 miles this morning. 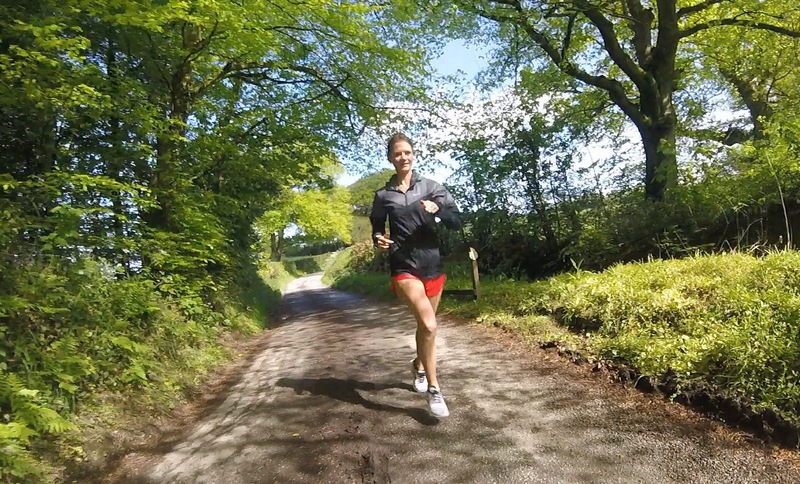 Have ran 47.5 miles so far this month!” I think she must’ve been inspired by reading Jo Pavey’s book This Mum Runs, I managed to get it signed when Jo came into The Running Works and sent it to mum for Christmas. It was also great to know Tilly and Uncle Andrew were training well; I could see they were increasing their mileage sensibly, thanks Strava. My Auntie Hannah decided not to do the 10k as she wanted to cheer but she has recently started running as well. She is a regular parkrunner and has been really enjoying it; she’s lost a lot of weight and knocked a massive amount of time off her parkrun PB in the last few months. I’m really proud of all of them for starting running and making so much progress. 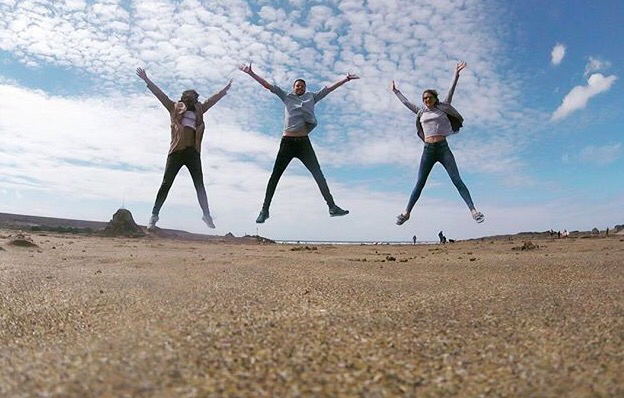 It had been 8 months since I had last been in Devon so this trip was well overdue. We got the train to Exeter on Friday night to get a lift to Pyworthy with Sarah (my sister). On Saturday morning Lorna and I went for a 6k shakeout run, the weather was great and it was nice to be out in the fresh air. After freshening up we popped up to see my gran and grandad. As Lorna hadn’t been to their house before I showed her the shed where I used to help grandad with odd jobs and play darts. It was great to be back there, it was funny because in my mind the kitchen and shed were a lot bigger but I guess I remember them through a small persons eyes. After a good catch up Sarah, Lorna and I travelled down to Bude for lunch and an ice cream. When we got back my stepsisters Nic and Kelly and my nephew Caleb had arrived. It was great to see them and play trains with Caleb; it’s amazing how much he has grown and he can speak so well. The day was flying by, we chilled for a little bit and then went out for a meal. We all carb loaded up for the race, and then we watched some TV and got an early night. Race day arrived; I woke up around 7am feeling fresh and raring to go. With the race not starting until 10:30am we had plenty of time for breakfast and to sort race kit. I opted for my new Iffley Road Lancaster Maple Stripe Vest, Thompson Gravel Black Shorts, Stance Uncommon Solids Crew socks and my trusty Adidas Adios. We arrived in Bideford an hour before the start, this allowed us to catch up with everyone and do a little bit of a warm up. In the lead up to the race I was feeling really relaxed, I think it always helps having either friends or family around. 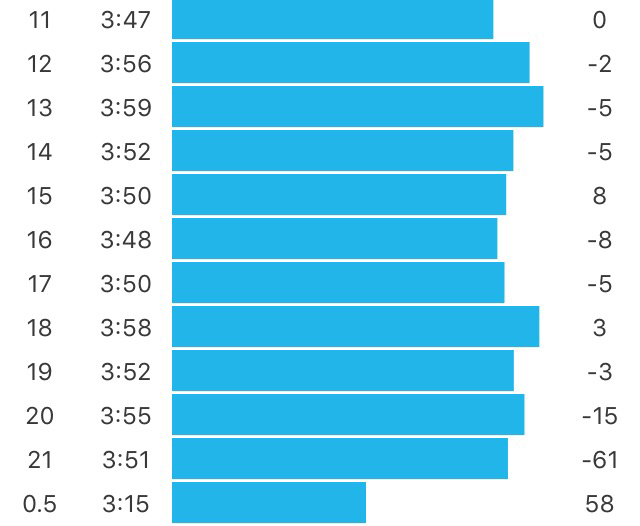 Also, I hadn’t really set a goal time or trained specifically for the race so there was no added stress. I was excited for my mum and Tilly and couldn’t wait to see how they’d get on. As 10:30 neared we all positioned ourselves on the road side, no start corrals here. Having looked at the results from 2016 and knowing the route narrowed over a bridge in the first kilometre I decided it would be good to start on the line. After training for and completing the Boston Marathon my legs were feeling good. In the weeks since the marathon I did the Hackney Half, went to track a couple of times and have started to increase the mileage again. With my 10k PB being 34:50 I decided to aim for 3:30min/km pace and go from there. Joining everyone else in speeding off the line I went through the first kilometre in 3:21. This was a little quick however knowing there was a short sharp incline at the start of the second kilometre I was happy to bank a few seconds. After the climb I settled into my target pace, I was in about 9th position but after a few more kilometres I passed a few runners. The front two were off into the distance, not to be seen again but there was a small group that I could try and reel in. 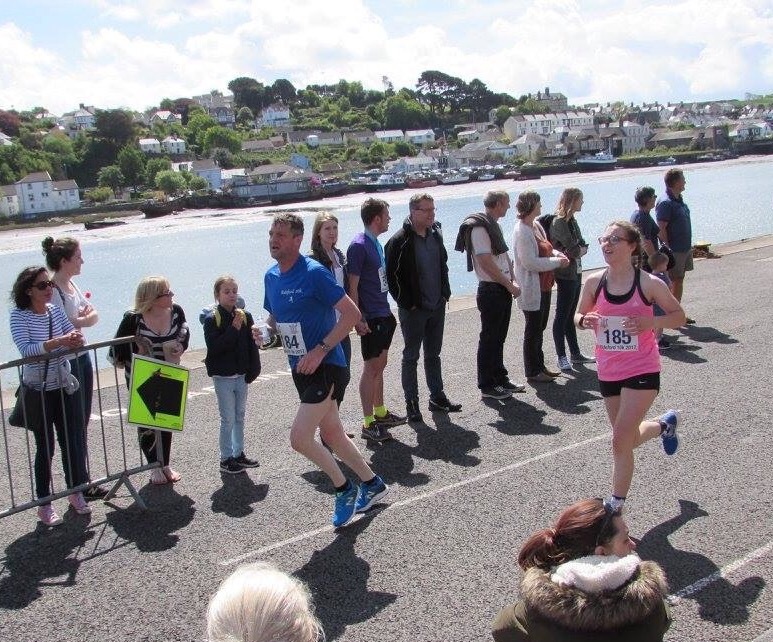 I was closing the gap, probably around 200m or so behind them at the turn at Instow (5k in). After making the turn the wind was blowing straight into my face, I decided to close up on the group and tuck in behind for a while. I eased off a bit and this cost me a few seconds, my 7th kilometre took 3:44. Despite the wind it was nice to be running alongside the River Torridge. When there were openings in the trees on my left I tried to spot Lorna, Tilly, Uncle Andrew or mum on the road to see how they were getting on. Unfortunately, I didn’t get to see any of them. My legs were feeling good, I passed the group of runners and set my sights on trying to catch 3rd place. One of the runners from the group upped his pace and stayed on my heels. I picked the pace up a little clocking 3:37 and 3:34 for my 8th and 9th kilometres. I crossed the bridge and dodged an elderly couple with bikes at the traffic lights. With 400m to go I moved through the gears, I couldn’t catch the runner ahead but I made sure not to be overtaken. I crossed the line in 35:02, 4th position. 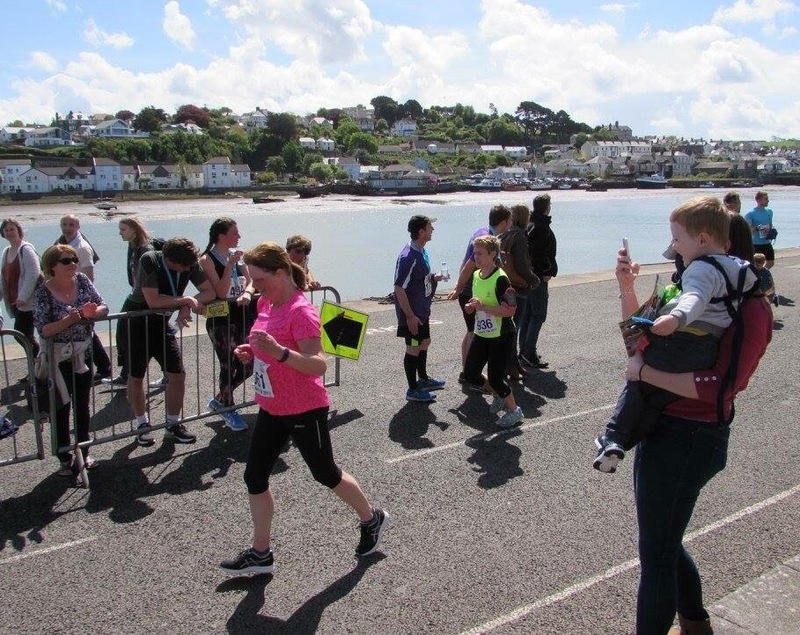 I had a quick chat with Sarah, Auntie Hannah, Eliza (cousin/chief cheerer), Auntie June, Nic, Caleb, Auntie Kath, Uncle Dave & Bex before running down the home straight with Lorna, cheering her in. She finished in 43:58, 90th overall and 4th in her category. I met her after she came through the finish line, we then ran down the finishing straight with Tilly and Uncle Andrew. She was still running really well and my uncle was encouraging her all the way. She crossed the line in 51:58, 354th position, 4th in her age category. Well done Tilly (and Uncle Andrew)! Lorna and I ran to the bridge again to wait for my mum to cross the river. We were looking out for her pink high-vis top. She took the corner smiling and waving at us. She asked how we’d got on whilst upping her pace in the last 400m. I went ahead to get a good position to cheer her in, I gave her a high five and she crossed the line in 1:01:24, 708th overall, 32nd in her age category. It was such an awesome moment and I’m so proud of her for putting in the training and finishing the race. Overall it was an awesome race and a great day. Here’s a link to a video of the race: https://m.youtube.com/watch?v=mTb__u4gh1w. I’m hoping we can all do a race again soon and I’m looking forward to seeing how much they all progress in the next few months with other events coming up. On Sunday 30th April I took part in the Hackney Half Marathon for the fourth consecutive year. 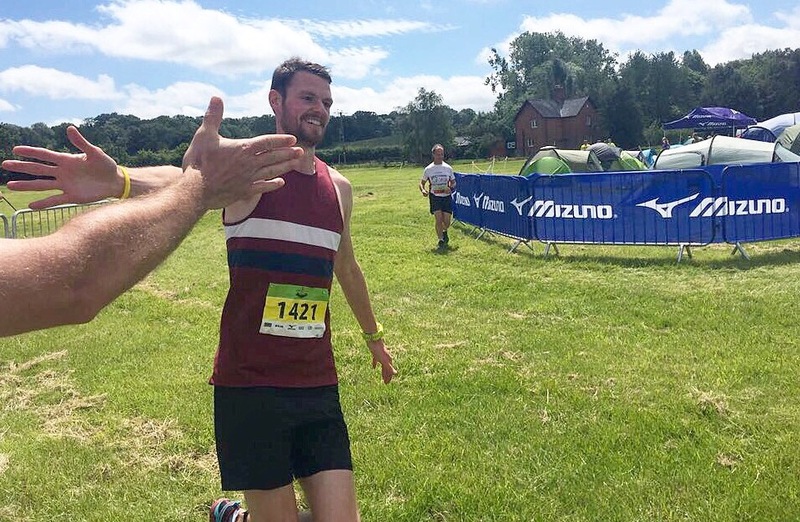 With only two weeks having passed since the Boston Marathon (https://www.iffleyroad.com/blogs/journal/what-its-like-to-run-the-boston-marathon) initially I wasn’t planning on running. However, as my legs were feeling relatively well recovered I decided it would be good to get them ticking over. I thought it would be a great opportunity to catch up with some friends and I always enjoy the crowds around the course. I was also really lucky to get a free media place thanks to Virgin Sport and Marcus (@themarathonmarcus). 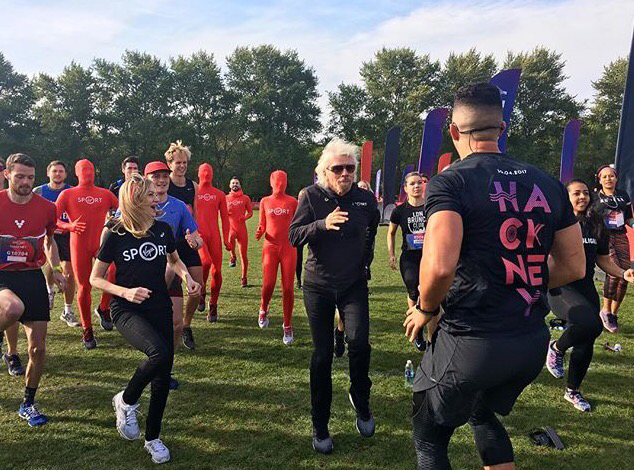 As this was the first year that Virgin Sport were organising the Hackney Half I was interested in seeing what their “festival of fitness” would look like. I woke up around 6am to get my running kit together and head across the city. I was really looking forward to the event, as my legs were still carrying the Boston miles I was nice and relaxed and wasn’t going to worry about my finishing time. My plan was to set out at around 4min/km pace and go from there. 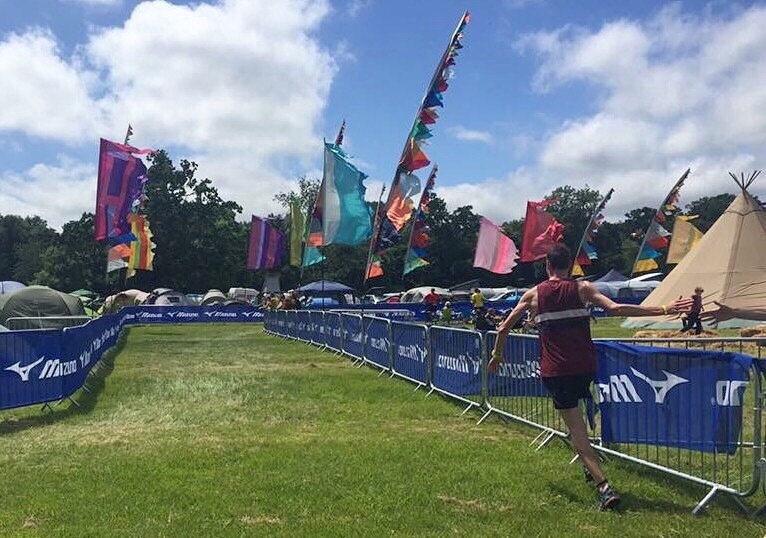 I walked from Stratford to Hackney Marshes and arrived at the event village in plenty of time to pick up my race number from the media tent and chat to other runners. It was good to catch up with some of the Advent Running (and Adidas Runners) gang, Sarah, Melanie, Emma and Reka had also got media places. 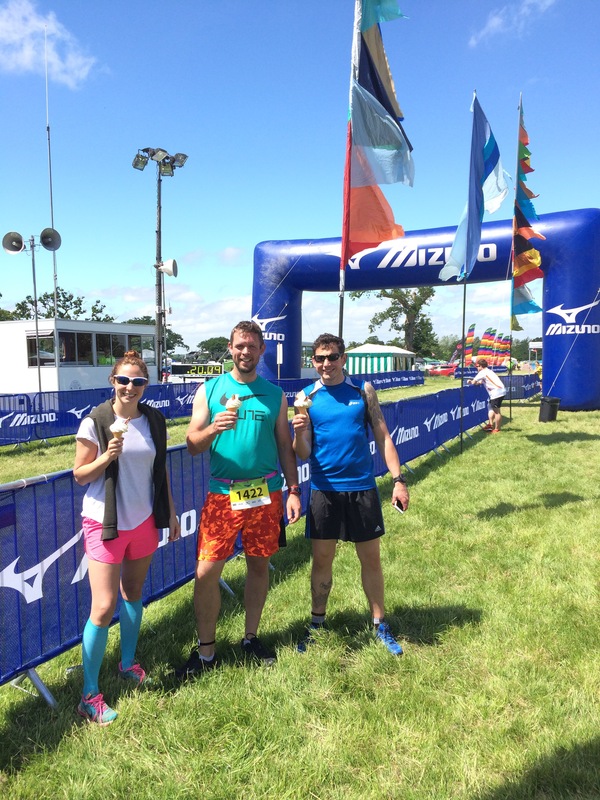 After pinning on race bibs we were called to another tent where Richard Branson and his son-in-law, the man with the idea of the festivals, gave speeches. The festivals have been created to get more people moving, whether that’s through running, jogging, walking, yoga, climbing etc. It’s an interesting concept and one that is taking off when you think about the creation of “The Big Half” from London Marathon events recently. Another key aspect to the events is working with the local community and groups, in Hackney they worked closely with Charlie Dark (Run Dem Crew founder), Chevy (Chasing Lights Collective), Fat Buddha Yoga and the Hackney Council to show what East London is all about. After the speeches we did a few warm up exercises and then we were led to the start corrals (still in Boston mode). I made my way to near the front and had a quick chat with friends Enrique (VPH runner) and Laurent (Nike run clubber). We all had similar race plans, Enrique was taking it easy having completed the London Marathon the previous Sunday and Laurent wanted to enjoy it and take in the atmosphere. I crossed the start line and began working my way into some space, it is a little narrow so I took it easy but got into my stride going up the first slight climb. 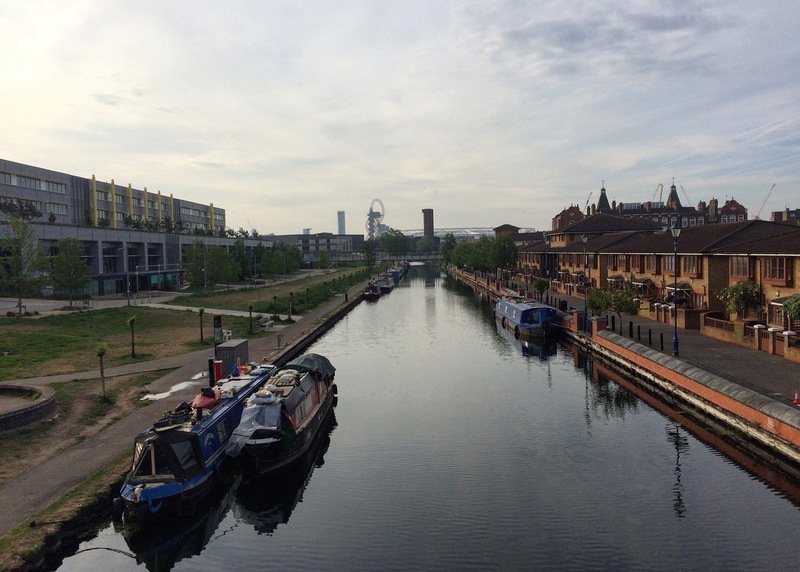 The weather was quite good, there was just a little bit of wind but I couldn’t complain as the last three years it has been a scorcher of a day in Hackney. Having ticked off a few kilometres my legs were feeling heavy but they seemed to be happy enough at closer to 3:50min/km pace so I went with it. 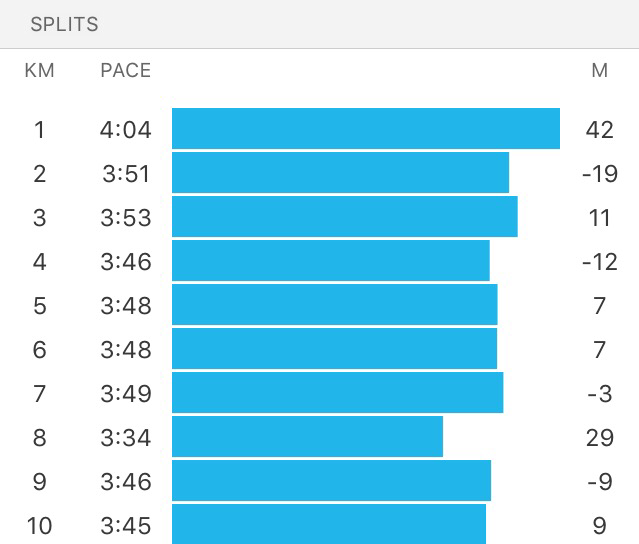 I passed Rory (Advent Running) had a quick chat about our Boston Marathon experiences and then ran ahead saying I was going to stick around 4min/km pace. Thing is whilst saying it I knew I wouldn’t be able to hold myself back. Every couple of kilometres there was music on the streets and the crowds were great. Another couple of kilometres went by, I bumped into Tony that runs at track on Tuesday nights and we had a quick chat. It was nice to see familiar faces, normally you only really see friends/family cheering around the course but due to the way I was pacing my run I got to spend some kilometres with them which was cool. It was good to be in a race where you knew you’d see people; Boston was obviously never going to be like that. My legs were still feeling good after completing 11k, I then thought of the last 10k as two 5k chunks. I knew it was around 5k to the Run Dem Crew cheer point near Crate Brewery and then the second 5k included a few hills and the crowds would grow around the Olympic Village. I was really enjoying the run; it felt so much better to be moving through the field as opposed to crawling/shuffling towards the finish as in the Boston Marathon. The Run Dem Crew cheer point/bridge was great to run through, they make a lot of noise for everyone which I appreciated as in some races you find it really quiet, supporters normally only look out for their family members or friends. The only downside to the RDC cheer point is that the following few miles in around the Olympic Park are quiet when you are starting to get tired and need all the help you can get. Basically they need to expand the cheer point from mile 10 to the finish. Having said that, once I had made it to the top of the steepest hill on the course I was cheered on by Jonny (KenYan Corner mastermind) and there were quite a few people near the big “RUN” sign. I knew at this point I had around 2k left to go. 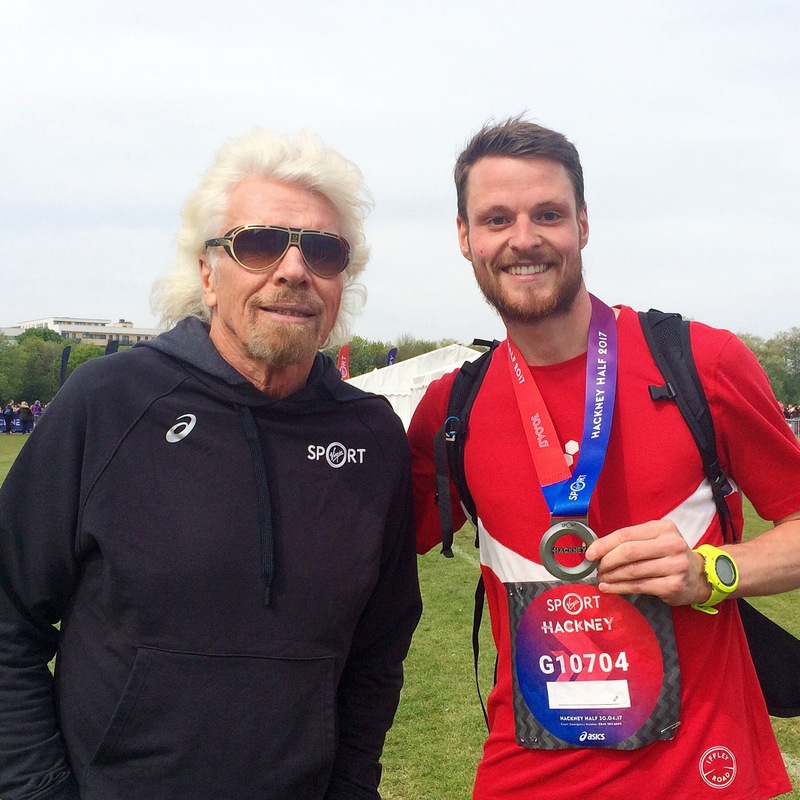 Last year I ran the Hackney Half with Jon from The Running Works Run Club. We had a great day and achieved a good time but I vividly remember him wobbling to the line from 500m or so out so I reminded myself to take it steady and only to push with 800m or less to go. At the end of the day I wasn’t anywhere near my PB so it was just fun to up the pace over the final 400m and cross the line with energy to spare. I was pleased to cross the line in 1:22:20 and relieved that my legs cooperated with me and got me round, it could have backfired. After crossing the line I bumped into Richard (NRC pacer) he had a great run doing 1:19 the week after London. I then picked up my bag and crossed paths with another Richard. 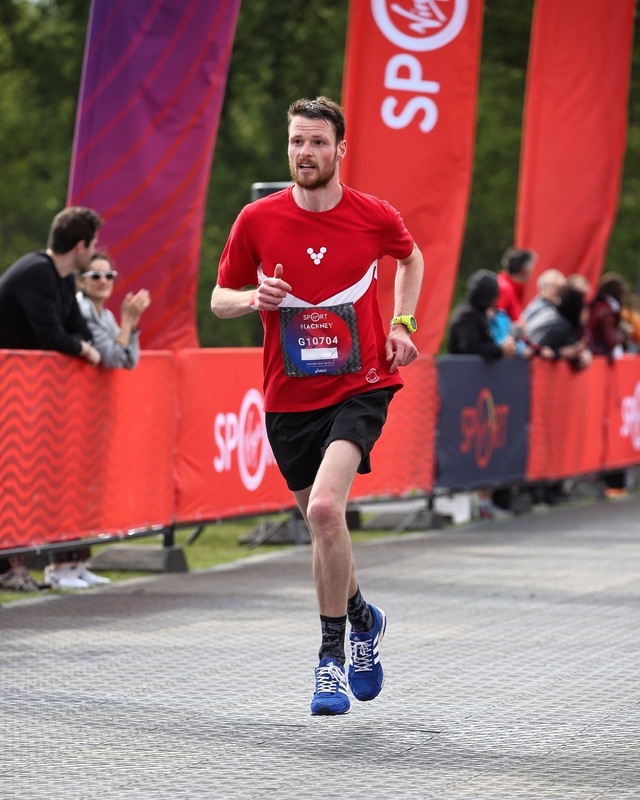 Overall the Virgin Sport Hackney Half Marathon was a really well organised event. I personally think it is a great thing they are encouraging more people to get involved and be active. It will be interesting to see how the festivals develop over time as I can imagine it is a hard task to get the balance of a well run race and provide facilities for other sports/activities. This was highlighted by the fact Richard Branson said “we will probably move it one month later next year so it is a bit hotter”. That would be good for supporters/the public but it could be a hot race again next year, interesting! 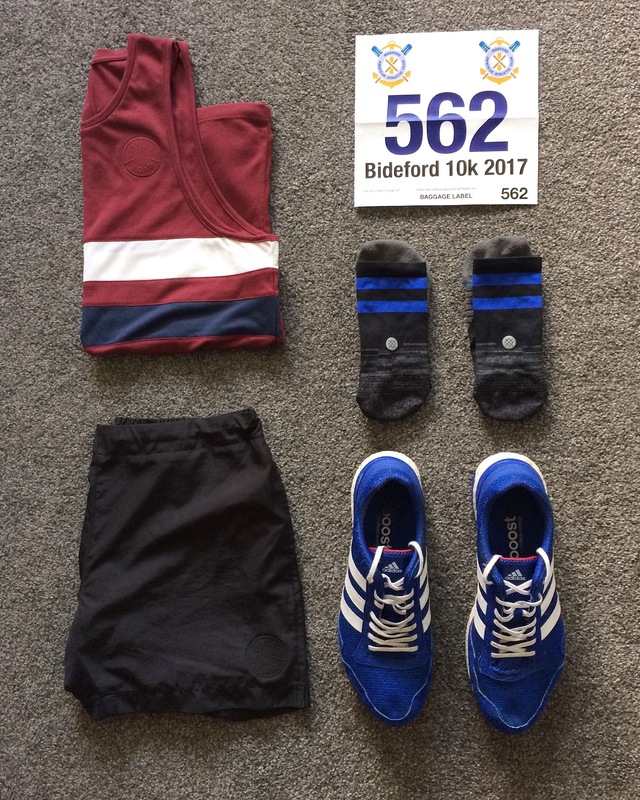 I was back on track on Tuesday and my next race is the Bideford 10k in just over a weeks time, really looking forward to that one!